Three “5mm” Ports Laparoscopic Nissen Fundoplication – the Least Invasive So Far. Laparoscopic surgery is well established for more than 20 years. Laparoscopic antireflux surgery is well accepted world wide and is prformed for many patients suffering from GERD. Some endoscopic treatments were tried in the past but the results have been less than satisfactory. Currently GERD is managed with operations performed laparoscopically with four or five ports. The author were involved with first twenty day case Laparoscopic Nissen Fundoplications with good success and no readmissions. This was a significant advance in surgical management of GERD. We believe that reduction of abdominal wall trauma and gentle retraction on liver may help to further reduce the post operative pain, reduce the risk of port site hernia and improve recovery with even shorter post operative hospital stay. The cosmetic results are certainly much better than the conventional four or five ports technique. We have improved our technique and now in selected suitable cases we perform Laparoscopic Nissen fundoplication with just three 5 mm ports. 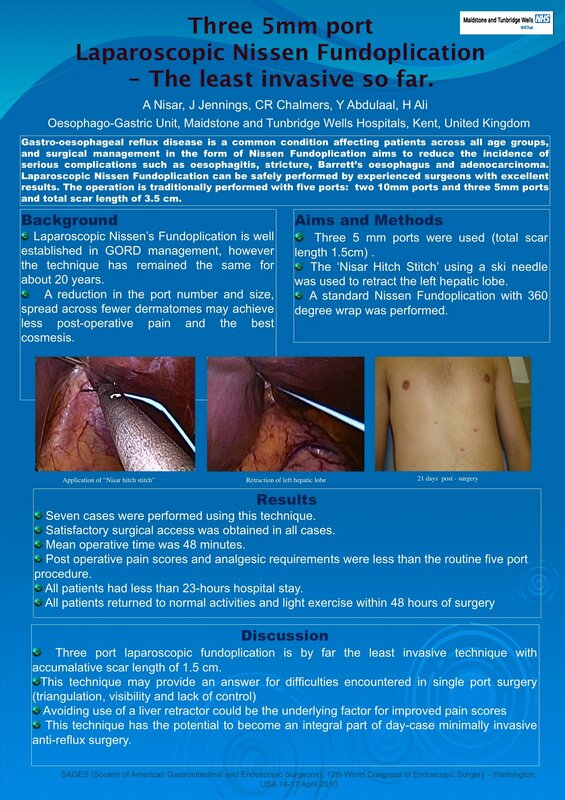 The authors believe that his technique also has the advantage of offering appropriate triangulation, better visibility and control which is not possible with Single Port Access approach for such surgery. We have successfully performed eleven operations so far with this technique. The patients selected for this procedure had low BMI (23-29) with lax hiatus or small hiatus hernias only. After veress needle pneumo peritoneum a 5 mm camera port is placed at mid point between the xiphisternum and umbilicus. After initial laparoscopy another 5 mm port is placed in left hypochondrium and a third 5mm port inserted in right upper abdomen just to the right of the midline. A diaphragmatic (‘Maidstone stitch’) suture is placed to retract the liver and its ends retrieved through the upper ports. The surgery is carefully performed ensuring good visibility and triangulation through out with out compromising the mobilisation and an effective repair. The short gastric vessels are divided in routine. Cruroplasty is performed followed by a floppy 360 degrees 2cm wrap on the lower oesophagus. The stay suture is removed and the skin of the 5 mm ports is closed with subcuticular suture. Patient is allowed to drink and eat the same day. We have performed 11 operations so far. No complications were noted in our patients undergoing three 5 mm port technique. Operative time is longer than standard five port technique (47 minutes as compared to 28 minutes). Blood loss is minimal (average 0-2 mls like conventional five port surgery). At present the numbers are too small but the authors believe that with this technique the blood pressure variations during the surgery will be less, post operative pain will be far less than conventional technique and probably the post operative stay will be shorter. Three "5 mm" port Laparoscopic Nissen Fundoplication is safe and feasible for selected patients and offers better cosmesis than the traditional four or five port Laparoscopic Nissen Fundoplication. This technique also offers better visibility, triangulation and control than single port access.